It's October, which means, it's Christmas time? Ok, not really, but we are at the point where talk of the holidays will start to sneak up on us. 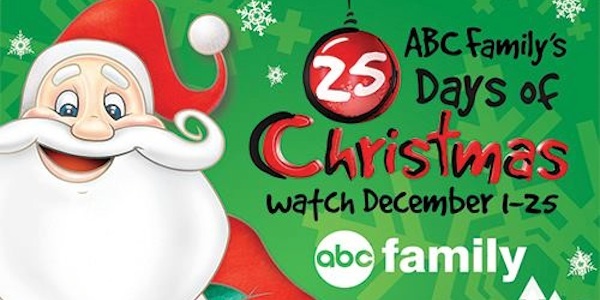 ABC Family is gearing up for their annual 25 Days of Christmas event, which traditionally begins December 1 and runs every day up to Christmas with a slew of holiday programming. That includes classic holiday films -- both animated and live-action -- and some original movies. This year, that includes Holidaze, a 25 Days of Christmas Original Movie that will star Jennie Garth and Cameron Mathison. Set to debut Sunday, December 8 at 8:00 p.m. ET/PT, Holidaze stars Garth as Melody Gerard, a high powered corporate workaholic for a retail conglomerate whose boss sends her to her sleepy hometown for the holidays, where she's tasked to convince the reluctant townspeople to let them build a new discount store there. Mathison plays Melody's childhood sweetheart Carter McClure. He and Melody's family aren't on board with what she's trying to do. And that's where things take a (sort of) It's a Wonderful Life turn as Melody slips and falls and wakes up in an alternate universe where she never left home and she and Carter are married. There's the twist! Something tells me she'll come out of this ordeal with a new perspective. And we'll come out of it with warm and cozy holiday cheer… hopefully. This year's 25 Days of Christmas line-up includes Dr. Seuss' How the Grinch Stole Christmas (the live-action Jim Carrey one), The Polar Express, Disney's A Christmas Carol, National Lampoon's Christmas Vacation, The Santa Clause and all three Toy Story movies. Ok, Toy Story's not Christmas, but neither was Harry Potter and those films have been on the line-up in the past. Not this year though. (10:00 PM–12:00 AM ET/PT) DECK THE HALLS: ABC Family Premiere. Steve (Matthew Broderick) gets into an increasingly absurd war with his new neighbor Buddy (Danny DeVito), when Buddy decides to decorate his home with enough Christmas lights to be seen from space. (8:00–10:00 PM ET/PT) HOLIDAZE—ABC Family Original Movie Premiere: High powered executive Melody Gerard (Jennie Garth) returns to her sleepy hometown to try and convince everyone to let her company build a giant new discount store. But she’s unexpectedly met with resistance by the townspeople—led by her childhood sweetheart, Carter (Matheson). Desperate to get out of town and back to her “real” life, Melody takes a spill and wakes up in an alternate universe where she never took the job and is married to Carter. (8:00–9:45 PM ET/PT) DISNEY’S THE LITTLE MERMAID—ABC Family Premiere: Mermaid Ariel dreams of seeing the world above the sea. Fascinated with humans, she saves a shipwrecked Prince Eric and sings him to back to health. Desperate to see him again, Ariel makes a bargain with sea witch Ursula that would allow her to be human—but it strips her of her voice. She has three days to find Prince Eric and receive true love’s kiss—or she’ll be sent back to the sea and belong to Ursula forever.